This week for new movies, we have animated bird, something with Kevin Costner, and a scary movie that will try to win our fear factor in the middle of April. 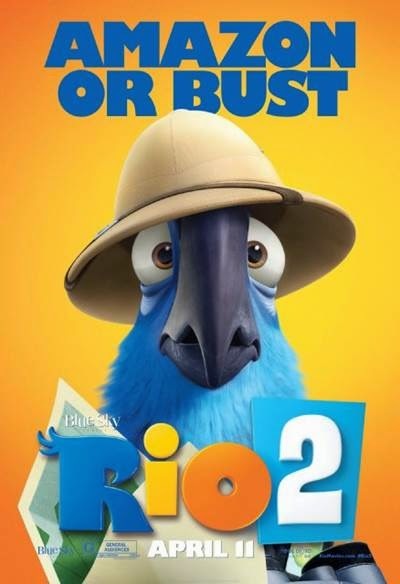 So will the RIO franchise step up and take the place of the older Ice Age series? Was I not paying attention or did the marketing for this movie barely begin just last weekend? So a horror flick in April, during tax season no less. But will Dr. Who's Karen Gillan pull in enough fans? The super soldier helped crank out April box office records this last weekend and I'm assuming will help to set more April records with the next upcoming weekend. Then again, as ticket prices go up, sure, more money will be spent at the theater, but does that mean more butts are in movie seats too? As it is, aside from the top few films, I've never seen such a weak top-10 list, where the bottom three are barely making $2M! Movies with IMDb user scores included, in case you need some help deciding.